Discussion in 'Manchester United Forum' started by Wumminator, Feb 23, 2019. On the 5th August 2011 Manchester United were preparing to say goodbye to veteran midfielder Paul Scholes who had chosen to retire at the end of the previous season. The club had organised a testimonial game against New York Cosmos to see off the legendary United player. After scoring a fantastic goal, Scholes was subbed in the 75th minute. His replacement was the teenager Paul Pogba. Seen as the heir apparent to Paul Scholes ; Pogba had been itching for the chance to make his mark at Manchester United. Unfortunately it didn't quite work out. Throughout the rest of the 2011/2012 season, Pogba only took part in seven football games, with his minutes in important games limited. His lack of game time and a contractual dispute with Alex Ferguson meant that United's midfield prodigy left Old Trafford to play in Italy. He would stay for four years in Italy, helping Juventus lift four league titles. But after spending most of his formative footballing years away from the club, Pogba returned at the start of the 2016/2017 season, becoming the most expensive footballer in history. Pogba would continue his hunt for trophies in his first season at United, helping United secure the League Cup and then scoring in the Europa League final against Ajax. The following year saw Pogba questioned by parts of the media. He had not adapted as well as many United fans had hoped, especially after the large outlay on the player. Pundits on television started to question Pogba's discipline. The midfielder helped quash these claims with a stand out performance against eventual league winners Manchester City at the Etihad. Pogba produced a man of the match display to ensure City did not have the chance to lift the trophy against Manchester United. Nevertheless, many speculated that the midfielder would not be a long term success at United. This season has stopped any of those rumours. Pogba has had a resurgence under the newly appointed Manchester United manager Ole Gunnar Solskjaer and has shown the form that helps explain the high transfer fee. He has currently scored fourteen goals this season, smashing his previous records for the club. At his best Pogba is lightning quick, impossible to tackle and possesses a majestic passing range. It has been a bumpy journey, but Pogba is quickly establishing himself as an Old Trafford legend. Alao i forgot paek wasn't in the 2008 cl final squad. Didn't fergie speak about that? Said it was the hardest decision he'd had to make as a manager. Sir Alex Ferguson is certainly one of the most influential men in Manchester United's history. The manager oversaw over 10 Premier League winning teams, as well as teams that garnered success in Europe throughout his decades long tenure. When asked about picking the best team in the time he had been at the club, he pondered the question for a while, before deciding it was impossible. He had overseen too many great players. There was however, one player he thought was deserving of a place. "Honestly, I would say Denis Irwin would be the one certainty to get in this team", said Sir Alex. Praise doesn't come much higher than that. Dennis Irwin signed for Manchester United in 1990. He immediately went into the first team and stayed there for 12 more years. Throughout his time at Manchester United he was Mr. reliable. Always giving solid steady performances, his defending was consistent and strong, his attacking runs constant and his energy kept him playing at Old Trafford deep into his thirties. He was lethal with a free kick as well and would often chip in with goals from the penalty spot. Indeed, to this day Irwin remains 84th on the list of Manchester United top scorers. Only seven players have played more times for Manchester United than Dennis Irwin. His remarkable career at the club saw him win seven premier league titles, three FA Cup trophies, a Champions League, a League Cup and one Super Cup. His outstanding career was highlighted in the 2002 Premier League celebration, which saw him named at left back of the decade in the Premier League's inaugural ten years. His remarkable consistency and high level of performances can be summed up in this quote from Alex Ferguson, "At Highbury in one game, he had a bad pass back in the last minute and Bergkamp came in and scored. After the game the press said: 'You must be disappointed in that pass back.' I said: 'Well, one mistake in 10 years isn't bad.' He was an unbelievable player." The fact he is so highly valued by his old manager, the fans at the club and by his fellow professionals shows why Irwin scored so highly in this list. When Sir Alex Ferguson signed young Peter from Danish side Brondby on the 6th August 1991 he was relatively unknown in England. However in the eight years he played for Manchester United he quickly established himself as one of the best goalkeepers in the world. 10 years on from his initial signing, Ferguson described the keeper as "the bargain of the century." It's not hard to see why. In his initial year at Manchester United, Schmeichel was voted the best goalkeeper in the world and came so close to the Premier League title. A year later the team went one better and Peter kept 22 clean sheets in the league as United won the premier league for the first time in 26 years. He would go onto win another four Premier League trophies in his time at the club, including the treble season of 1999, the year Peter Schmeichel chose to leave the Red Devils seeking to find a slower paced league at the age of 36. It's hard to pick the Danish keepers best attributes. He was fantastic at distributing the ball, his long balls became the stuff of legend. His reflexes were top notch, anything but the best shot wouldn't beat Schmeichel. His ability to make himself big and control the box when strikers were racing towards him was phenomenal and has never been recreated. Safe to say United fans could relax with Peter in goal. This was only emphasised further with the time it took to replace the keeper in the United net. Although many players tried, it wasn't until Edwin van der Sar arrived years later that we truly had a keeper who could hold a candle to Peter. No-one knew Peter better than the players and managers who worked with him throughout his time at United. Very good thread Wumminator, some good and deserved names but I reckon under 13 posters have kind of ruined the list considering we have the likes of van Persie, Herrera and Pogba so high on the list. However there are a new generation of fans who only know these players. It’s interesting to me how Herrera or RVP can be so high but then again I have family members who are around 18 and list RVP as there favourite player. van Persie is our last world class signing under our greatest ever manager, winning us our last PL title. His inclusion is completely justifiable. Paul Pogba is one of the best midfielders in the world right now. Herrera is a little iffy, but I guess that’s just recency bias and the fact he shares redeemable traits to the old days. In any case, it’s RedCafe’s favourite players. Not the best. Personal opinions, eh? "The signing of Michael Carrick, a Pirlo when a Gattuso was needed, is a band aid for a bullet wound, and a ludicrously expensive one at that." - Rob Smyth The Guardian in an article entitled Ferguson - Shredding his legacy at every turn. When Michael Carrick arrived at Manchester United over a decade ago, the above quote succinctly sums up the attitude to the signing of the English midfielder. United had just sold star striker Ruud Van Nistelrooy to Real Madrid and Michael Carrick was the only signing United chose to make that summer. It became evident that most people thought that this would start the downfall of Manchester United. A decade of appearances later, Carrick had won the Premier League five times and won the Champions League. Not bad for an overpriced band-aid. Michael Carrick was often under appreciated in his time at Manchester United. As you can see above for a midfielder he doesn't add much of a goal threat and his assist statistics aren't much better either. However it is his ability to intercept and build the play that has made him such an asset to a Manchester United side for over 10 years now. His style of play led Ferguson to call him "The best English player of the game" (in 2014). He made his debut in 2006 away from home against Charlton. Over the course of that season Carrick made over fifty appearances for the Red Devils and helped United claim back their Premier League trophy from Chelsea. He was a constant in the midfield of United for the next eleven seasons, only retiring in 2018 after age had caught up with the midfielder. Carrick now sits 16th in Manchester United's top all time appearance makers. His trophy cabinet alone symbolises how important he was to United over a period of complete domestic dominance. Now sitting in the Old Trafford dugout in a coaching capacity, Carrick remains an integral part of Manchester United to this day. Finally my third best fave player. He's an artist of football. United under SAF always had British core in central midfielder. Maybe we should be back to basic with future CM recruitment. The amount of stick he got when he was here was maddening. You don’t know what you have till it is gone. You're right. That stigma of 'always pass 2 yard sideways' was his for years, forgetting there's no way SAF, the risk taker, would let him do that if it's useless. In later years, he added more of those long passes to his forte. But I always loved his simplicity style before that, showcasing his excellent football intelligent. Carrick was one of those players who received no appreciation till 12/13 season. Even then, a lot of fans weren't convinced with him and it was only after Wenger praised him that all our fans started to take notice of what he brings to the side. Bobby Charlton epitomises Manchester United. He is the second highest scorer in the club's illustrious history and his statue proudly stands outside Old Trafford cementing himself in the lore and continuing story of this football club. His footballing achievements are astronomical, but it has to be remembered that Charlton is also known for being an ambassador for the club, his name becoming synonymous with fair play and kindness. Manchester United signed the 15 year old Charlton on the 1st January 1953 after the young striker had impressed local scouts. He would work his way through the youth teams destroying all that come before him until he made his debut for the first team in a league match against Charlton in 1956. He would score two that day to secure the win for Manchester United. Not many would have predicted that this player would go onto lead the all time scoring charts for the club over 50 years later. After the game Charlton would have to travel back to Shrewsbury where him and Duncan Edwards were completing their national service. Football was a different game back then. Charlton went onto score ten league goals for Manchester United in that year, his first of a seventeen year spell at the club. He would also lift the First Division trophy for the first time, his later United years would contribute another two trophies to his collection. A year later he would take part in the European cup campaign that ended in disastrous circumstances with the United team plane crashing in Munich. Although Charlton survived the crash, he was injured and upon being discharged a week after the accident he would return home without eight of his team-mates. At just 20 years old Bobby Charlton was now one of the players that Manchester United would build around and he would have continued success at the club. He was part of the team that lifted the FA Cup trophy in 1963, ten years after he initially signed for the club. He would then lead the club to the Premier League title in 1965 and 1967. And then ten years after the disaster in 1968 he would captain Manchester United to the Champions League, scoring twice in a 4-1 extra time win over Benfica. That would be Charlton's last major honour at Manchester United but he would still retire a legend at the club. After falling to such massive lows and raising the club to such massive heights, Charlton would leave the club on the 28th April, 1973. A hero both on and off the pitch, Charlton is remembered to this day for his ability to score a goal from anywhere with two immensely powerful feet. You can hear the admiration in his former manager's voice when Matt Busby says, "There has never been a more popular footballer. He was as near perfection as man and player as it is possible to be"
Sorry for the delay, I was smashed last night and ill today. So we welcome the last of United's holy trinity into the list. Best places just above fellow legend Bobby Charlton, narrowly missing out on the top ten, but the fact that the Northern Irish winger scored so highly is testament to how highly rated the winger was over forty years after he retired from Manchester United. When Best was just 15 years old, Sir Matt Busy would receive a telegram, "I think I've just found you a genius" came the message from United scout Bob Bishop who had been travelling around Belfast. Fast forward two years and Manchester United's future would be irrevocably changed as Best made his debut age just 17 years old on the 14th September 1963. Thus would mark his first appearance for the club that kick started an 11 year old career at Old Trafford. The next year was his first as a full time regular and Manchester United won the league. Best finished that season with 10 First Division goals despite being only 18 years old for the majority of the campaign. Best would mesmerise defenders with his incredible dribbling skill, and even at an early age Matt Busby would put Best in intensive training sessions to allow this beautiful natural ability to flourish. It was next year in a European Cup game against Benfica in which he scored two goals when the press dubbed young Best as "O Quinto Beatle", he truly was a megastar of his day, his gifts shooting him to worldwide popularity. Best would go onto add another First Division to his record in the 1966/67 season and would help United to the European Cup the next year. His spellbinding performances in the 1967/68 season would see him win the Ballon d'Or trophy as well as bagging the top scorer in the English First Division that year. Before the European Cup final, Best relaxed with "a particularly nice lady called Sue" and then would put United 2-1 up minutes into Extra Time. At this point Best was only 22. He seemingly had the world at his feet. Unfortunately, after this Best would never again lift a major honour for the Red Devils. While his demons have been heavily publicised it's safe to say that he still contributed in a major way for Manchester United later in his career, despite the fact that he would never again hit these giddy heights. Still you don't sit at five on the all time Manchester United scorers list without having consistent excellent goalscoring seasons. 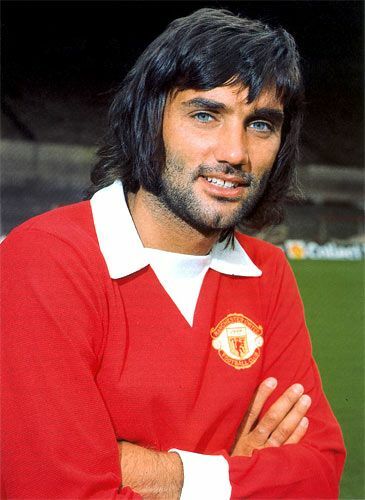 George Best's ability to slalom his way through big bruising defences, his excellent finishing ability and his insanely brilliant close control and dribbling style means that to this day, Best is a favourite at Manchester United. The Stretford End can be heard to this day singing songs about their hero and he will go down as one of Manchester United's most popular players. I'm finding this use of Champions League instead of European Cup slightly annoying especially when English First Division is used correctly. Pretty dramatic fall there for both Charlton and Best. Personally, I only voted for players I've experienced first hand. If I were to make a top ten including players that were active before my time, though, I'd have both these in it (obviously). Not as in, "greatest" as such (which is a no-brainer), but indeed as "favourites" based on what I know about them both as players and, well, historical United figures. Nani should be top 20 easily. He was on a different planet, compared to the players we have now. The only reason he is so underrated is because he had to follow in the footsteps of Ronaldo when he left. It was so unfair to compare him to maybe the best player we've ever had. Ofcourse he wasn't going to live up to those expectations. But he was an amazing player in his own right. A proper United winger. Fast as lightning, an incredible shot with both feet, could take on multiple players at a time and leave them for dead by beating them with skill and trickery. Not just by trying to hit the ball past someone and then trying to run past them. He's miles better than any player we have today. People go on about the "United Way" playing fast attractive football and taking risks. But then complain about Nani being inconsistent. If Nani was inconsistent what are Martial and Rashford? Understand the "younger" voters not having him up there where he should be. You'd have to have experienced Best from the terraces to realize how good he was. For me seeing him making his debut from the stands and the way he tore up defences, took the mickey out of so many so called hatchet men (Ron Harris comes to mind) and his performance in the final against Benfica, he has only one challenger for the no1 spot imho. CR7 comes the closest but he'd already left us when he reached the level required to go past Bestie. To play for Manchester United and become a legend you often need a certain type of personality. Speak to any Manchester United fan about Patrice Evra and they'll tell you he simply just "got" being a Manchester United player. His position on this list certainly isn't bad for a player who was hauled off in January 2006 at half time in his debut game against Man City. At the time, United fans wondered who the young French man was after he had signed from Monaco a week earlier. At the end of the 2006 season Patrice Evra had only made 14 appearances in all competitions for Manchester United, helping the team win the League Cup with a substitute appearance in the final. The next season Evra's form would explode and his season would culminate with a spot in the Premier League best 11. He would score in a 7-1 rout over Roma in the Champions League and would help United lift the Premier League trophy at the end of 2007. The next year would be even better for the left back as he would be a mainstay in a Manchester United team that won the league and the Champions League, including playing a full 120 minutes in the Champions League final against Chelsea. While this was to be the highlight of Patrice Evra's stay at the club, he would be continue to represent United in defence for the next six seasons. In 2009 he would once again represent United in the Champions League Final but the team would ultimately be unsuccessful in attempts to retain the crown. Nevertheless this was a fantastic season for Evra as he was named in the FIFPRO and UEFA team's of the year. His early mistakes now behind him, Patrice was a fantastic servant at United and this was rewarded when Evra was handed the captain's armband numerous times throughout the season. 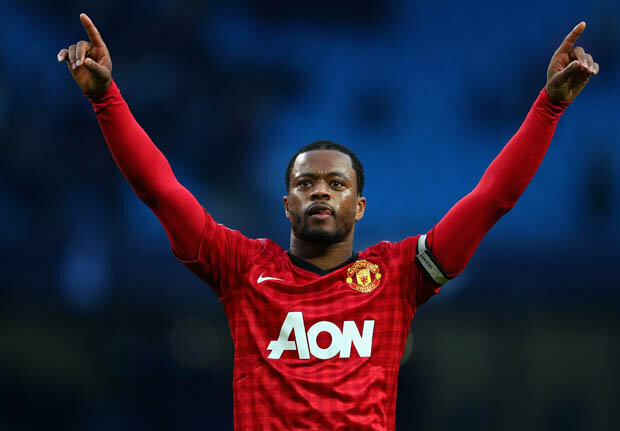 Overall in his time at Manchester United, Evra's attacking runs mixed with his solid defensive capabilities made him one of the best left backs in the Premier League era. He would win five Premier leagues in total at Old Trafford and would feature in the best Premier League Eleven three times in his nine year stay. His passionate temperament saw him draw ire from Scousers, Chelsea groundsmen and at one point seemingly the whole of France during his stay in Manchester but the Frenchman will go down as one of United's favourite players. In the 1992/93 season Manchester United finally ended a 26 year long wait and claimed the Premier League title, a lot of players from that season have previously been seen on this list. However, it probably meant more to Captain Marvel Bryan Robson than any other player on the pitch. In his twelfth season at the club the man who epitomised the clubs fighting spirit and never say die spirit had finally captured the elusive prize. His Manchester United story began much earlier when he signed for the Red Devils on the 1st of October 1981 from Midlands side West Bromwich Albion. The midfielder cost a British record 1.5 million transfer fee as manager Ron Atkinson wanted to be reunited with his player after he himself had made the switch from the Baggies. His league debut came on the 10th of October as he wore the number seven shirt for the first time in a draw with our arch rivals Manchester City. He would later make the number seven shirt his own and to this day fans can be seen at Old Trafford with his name emblazoned on their replica jerseys. It didn't take long for Manchester United fans to fall in love with the inspirational midfielder and he replaced Ray Wilkins as Manchester United captain early on in his Old Trafford days. To this day he is the longest reigning Manchester United captain as he kept the captains armband for almost the entirety of his stay in Manchester. In his second year at the club Robson would life his first of three FA Cup trophies. Playing in the 1983 final, Robson scored twice and turned down a penalty as United won the replay 4-0. He became only the second English Manchester United captain to lift the FA Cup and the first since 1909. He would add two more triumphs in 1985 and 1990. Along side his two premier league wins in 1992 and 1993 Robson has an impressive trophy haul in his time at the club. But even when United weren't winning trophies regularly they could turn up week in and week out and see the hard tackling midfielder giving it all for the shirt. His endless supply of stamina, never say die attitude and late runs into the box saw him become a perfect midfield general, someone who could lead by example and pushed his team onto greater heights. I'll leave the last words to someone who played under his leadership. You can tell from his words how respected Robson is and it is no surprise that when a group of Manchester United legends voted for their all time favourite Manchester United player in 2011, Bryan Robson came out on top. Feck me. Bryan Robson not even in the top 10. Just shows the the age group of people voting. I know it's not the best example to use, but trying to illustrate to the younger voters what's it's like. Imagine in 20 years time Steven Gerrard being Voted 12th best player for Liverpool of all time. If Liverpool have the same amount of success over the next 20 years that we had from 93-13 then that would easily happen. The thing is there’s at least.... four players above him that are completely unarguable IMO. Then eight that deserve it overall. One or two I don’t agree with. 0.6849. That's how many goals Ruud Van Nistelrooy scored per game in his spell at Old Trafford. That puts him ahead of everyone at the club apart from the great Tommy Taylor. To have a scoring record like that in the modern era shows how clinical Ruud Van Nistelrooy was. He was only at the club for five seasons (and missed a large chunk of one with an injury) but sits 11th on the all time top scorers list for the club with exactly 150 goals. Safe to say strikers don't come much more effective than the Dutchman. He would be undoubtedly higher up the list, but after a transfer fee was agreed in the summer of 2000, United pulled out of the deal after some doubts emerged over the strikers fitness. 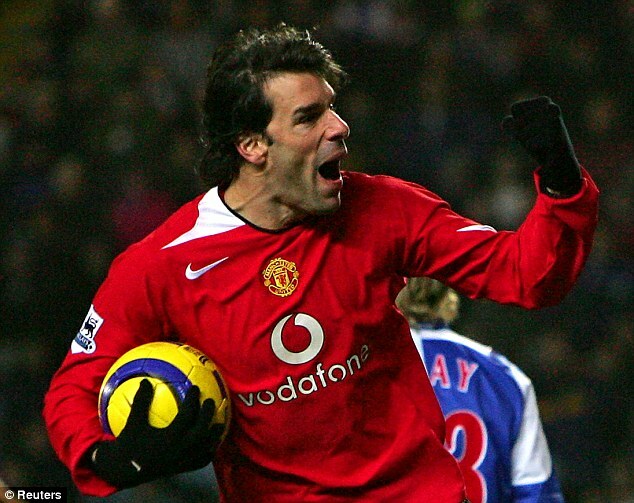 A day after the deal was pulled, van Nistelrooy ruptured his knee ligaments and missed about a year of football. Not to be deterred, Sir Alex Ferguson had confidence in the striker's natural ability and signed the player a year later, for a then record fee of 19 million pounds. He made his debut in the 2001 Charity Shield game against Liverpool. He scored. Of course he did, more often than not you'd put your life on Ruud Van Nistelrooy burying a chance. Only Thierry Henry has a better goals per minutes ratio in the entire of the Premier League history. He made his premier league debut against Fulham on the 19th of August and scored two goals in his first start. In December he had scored his first hat trick for the club in a 6-1 demolition of Southampton. He scored 23 league goals that year, hit ten goals in the Champions League and was voted the Players' Player of the year. The following season he would win the golden boot and help Manchester United lift the Premier League. He scored 25 goals in 34 games and hit another twelve goals in Europe. These goals in Europe helped him to become Manchester United's top all time Champions League goalscorer, a record he holds to this day. It's a shame that this was to be the only year in which Ruud Van Nistelrooy would lift the Premier League. Following the 1999 Champions League win, Ferguson started to rebuild his squad and part of the reason we remained competitive through this time period was the constant goal threat of Ruud. An FA Cup in the 2003/2004 season was the only other major honour Ruud Van Nistelrooy holds during the five years he spent at United. An FA Cup and a Premier League would be a massive honour for most players, but it remains a shame Ruud wasn't able to lift more trophies in his time at Old Trafford. When you think of Ruud two things come to mind, his impeccable goalscoring record and the fantastic emotion he showed during his time at the club. His winning penalty that ended the Arsenal unbeaten run was a fantastic moment, his emotion and jubilation etched over his face as he celebrated in front of thousands of ecstatic reds. In today's game, the 19 million pounds Sir Alex Ferguson paid for him in 2001 seems to suggest he was practically a bargain and he will remain a true great at Old Trafford. These goals in Europe helped him to become Manchester United's top all time European goalscorer, a record he holds to this day. Copied and pasted from last time, I imagine Rooney overtook him since then! Will post the next few over the weekend. Signing from Russian club and costing only 7 million pounds, Nemanja Vidic has to go down as one of the best bargains ever in football. When his work permit was cleared in January 2006, Old Trafford fans could not have expected the world class defender who arrived. His ability in the air and tough tackling nature make him one of the best centre backs in Premier League history. It didn't always seem like Vidic would be so successful. Upon his arrival at the club Vidic was seen as somewhat as a liability, with his lightweight frame often dominated. Paul Scholes would recount years later how Vidic was seen as easy to knock off the ball. But Vidic's character meant he didn't let that get to him, his dedication and professional nature saw him bulk up. "For the next year, every time I walked past the gym, I would see Nemanja in there lifting weights. He turned himself into a big, strong centre-half who was capable of knocking strikers out of the way." said Scholes after he retired. It was this strength and aerial prowess that made Vidic such a mainstay at the heart of the United defence. It didn't take long before his improvements were recognised across Europe. In the 2006/2007 season, his first full season at the club, Vidic was voted into the Premier League 11. His partnership with Rio Ferdinand that had begun to flourish would take Manchester United to the Premier League title and he would add four more titles to his collection in subsequent years. Individually Vidic was voted the Premier League's best player in the 2008/2009 and 2010/2011 season. The fans and players at the club would vote him the best player in the 2008/2009 season and the public voted him into the best Premier League side ever in 2012. It was in the aforementioned 2008/2009 season that Vidic was a mainstay in a defensive line that didn't concede a goal in 14 games. There's too much to write about the Serbian in this little extract. Safe to say that without Ferguson signing the player in the winter of 2006 we would not have had the massive success in the last decade. Thank you for everything you did for the club Nemanja. We often wax lyrical about Ferdinand but not enough is said about how great Vidic was. Bravest CB I've seen play for us and just had that winning mentality. Right, back from (my own) stag. Will finish this list this weekend! On 22nd July 2002 after weeks of intense speculation, Rio Ferdinand signed for Manchester United for a British record £30 million. He became the world's most expensive defender for a second time and became Manchester United's most expensive player, narrowly beating the fee paid for Juan Sebastian Veron. In his first season at the club, Rio was known for an occasional error, but overall had a positive influence on the team, helping United to a Premier League medal in his first season. He would play 45 times that year and become a mainstay in the heart of United's defence. The next year didn't go so great for Rio, after missing a routine drug test Rio Ferdinand was hit with an eight month ban and miss a large majority of United's season. The next season brought even more controversy, as Rio was seen dining in London twice with Peter Kenyon, then high up at Abromovic's Chelsea. His flirtation with a transfer move and lengthy ban meant quite a bit of the United fanbase were frustrated with him. However, that was just a blip in what will now go down as a legendary United career. In his twelve years at the club, Ferdinand would play over 450 times for the Red Devils, forging a partnership with Vidic that set records for how little they conceded and eventually he would retire at 18th on Manchester United's top all time appearances. Rio Ferdinand was absolutely majestic in his prime, his pace and positional awareness mixing fantastically with his eye for a pass and passion on the pitch. United's teams are often known for their swashbuckling attitude, but without a solid base to build upon there is no doubt the United team of the 2000's would have a lot less trophies. 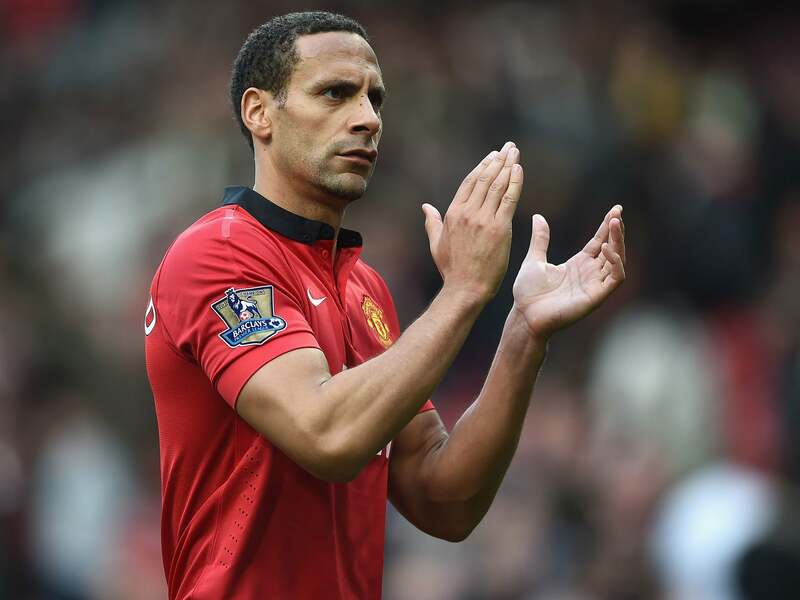 Rio helped United to six premier leagues while he was at the club. He would also lift the Champions League in 2008 and would be voted into the Premier League team of the year an incredible six times. His performances were rewarded with a space in the all time Premier League team in the 2011/2012 season. Credit for making a great thread, looking forward to the rest of the list.